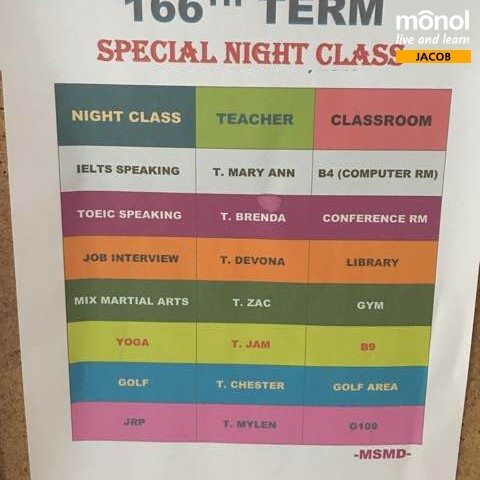 There are three curricula at Monol International Education Institute. The curricula are General ESL Speaking-Intensive Speaking, IELTS, TOEIC and Business English curriculum to help you prepare for the official examinations. There are five day courses for General ESL in the form of one-to-one and group classes. I personally prefer the Intensive speaking classes rather than the general ESL classes because I think it would be more helpful after taking the regular ESL in my first month. As I thought before the curriculum change, there is no longer homework after class, and the regular class itself is only 4 hours a day, so it is less burdensome and there is no fatigue. 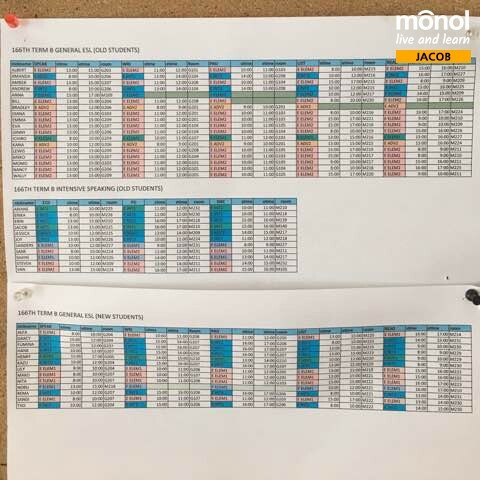 I cannot choose my schedule according to my preference from the beginning, but once I receive the schedule assignment at random, I can adjust the schedule to reflect on my opinion if I talk to the manager about the inquiries and suggestions. Here is the intensive speaking curriculum I’m taking right now. There are basically three subjects, DBC class is a listening and speaking class. Basically, after talking about the topic, you listen to the story, answer how well you understood the content, and check the words. Picture Description is a class with four pictures per day, along with the words that are appropriate for the situation, describing the situation (making a sentence) and describing the picture. 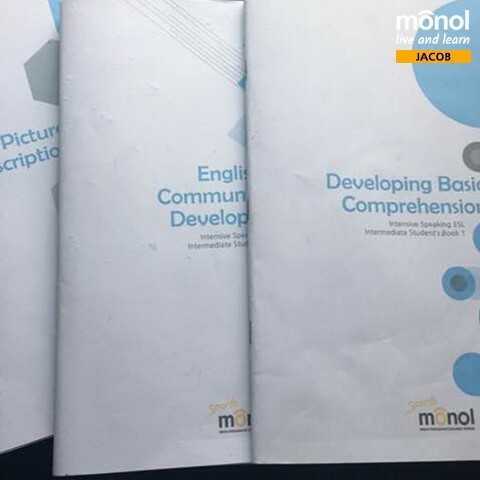 English Communication Development is abbreviated as ECD, which is a way to organize the simple grammar needed after speaking about a given topic. The difference between Intensive and Regular ESL is that intensive courses are one-on-one, and the lessons can be focused on talking with the teacher all the time. I enrolled in the intensive speaking lessons. After consulting with the manager as mentioned above, you can make the most adjustments to the direction you want. 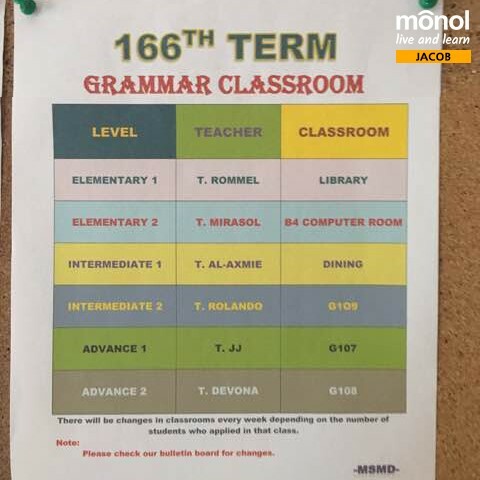 If you want to take additional classes besides regular classes, there are night classes and grammar classes that you can apply for free during the afternoon. After regular classes, you can take any additional study you need. 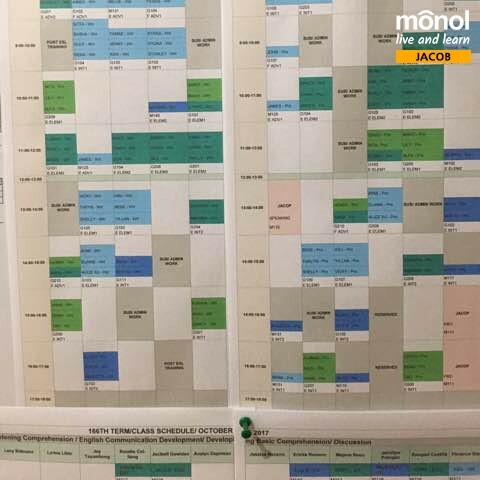 if you come to Monol Language School and study, you can improve your English skills by studying on your schedule!